No doubt, as portrayed in the movie, General Patton's request for a fair-weather prayer in order to crush the oppression and wickedness of our enemies" must have come as a bit of a shock to the chaplain. In essence, this prayer was one pleading with God to allow the Allies the upper hand in battle—maximizing Axis casualties in an effort to establish Thy justice." This request is especially troubling to me in light of the fact that many German soldiers were devout Christians, answering their nation's call as they understood it. As confident that the Allies were that God was on their side, no doubt many among the Axis (especially Germans and Italians) were sure of the same—especially late in the war when the U.S. resorted to fire-bombing entire cities and dropped nuclear bombs on Japan. An objective look at WWII makes it plan that the execution of the war (i.e. jus in bello) can by no means be considered 'just' with respect to either side. Both sides committed horrific atrocities, though interestingly only those committed by the 'losers' have come under much public scrutiny. What does this have to do with my role as a chaplain today? Plenty. Today, thanks to Remotely Piloted Aircraft (RPAs) or 'drones,' our Airmen are fighting in Afghanistan, Iraq, Syria, and Yemen from the comfort of their hometowns. As our military forces are made up predominately of Christians, and our foes are predominately Muslim forces, it is even easier than before for us to believe that God is on our side. (This makes for a strange Crusader-like mentality among many troops, especially Evangelicals, but that is a topic for another post.) 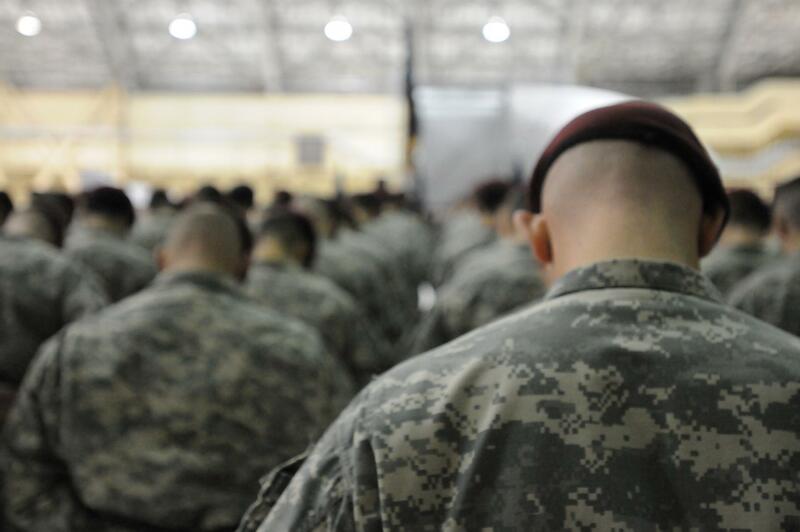 During the multitude of ceremonies we have on base, chaplains are expected—implicitly by tradition or explicitly by commander request—to pray for our military successes around the world. Here’s the problem with that prayer as it usually plays out. As during WWII and every war before or since, military success consists entirely in killing enough of the enemy to get them to capitulate and surrender. There is no other way to win a war. Wars aren’t won by occupying land, building alliances, or anything else—they are won by killing so many of the other side that it breaks their will to continue fighting. So, in essence, the chaplain's victory prayer is about praying that we might kill a sufficient number of 'bad guys' (both military and civilian if we can be really honest) that the enemy decides to quit fighting. Those who think much about the reality of war understand this. One of my commanders, whom I highly respect for his leadership and his faith, has even put it to me like this when discussing civilian casualties: I'd rather kill all of their children than let one of ours be killed." Enter the really hard part, courtesy of Jesus. "I tell you this: Love your enemies, and pray for those who persecute you. In this way you show that you are children of your Father in heaven" (Mt 5.44-45, GW). Our prayers (including some of mine, I confess) fall woefully short of Jesus' expectation. While I have prayed for peace during nearly every invocation, it has always been a future ideal state, not something I expect to see soon. And I have never prayed publicly for our enemies as Jesus commands—that they (and we) might lay down our arms; that they (and we) might truly desire and work toward peace; that they (and we) might see the futility, horror, and utter waste that is war. To my fellow chaplains, we must continue to pray. We must pray for victory, but we must pray for that victory which is honoring to Christ and in conformity with his will, which may be in complete contradiction with the will of our generals, our elected officials, and even the people we serve. Lord Jesus Christ, son of God, have mercy on me, a sinner. May my prayers, both private and public, conform to your will and your desires for all people...not simply the 'good guys.' Amen.